C20 Tetraforce Activator is one of the highest quality Vitamin C Concentrates available. Extremely potent, yet gentle, effective, stable, non-peeling, non-acidic, anhydrous (water-free) Vitamin C Activator is formulated with 20% of stabilized, lipophilic (oil soluble) Vitamin C derivative - Ascorbyl Tetraisopalmitate. 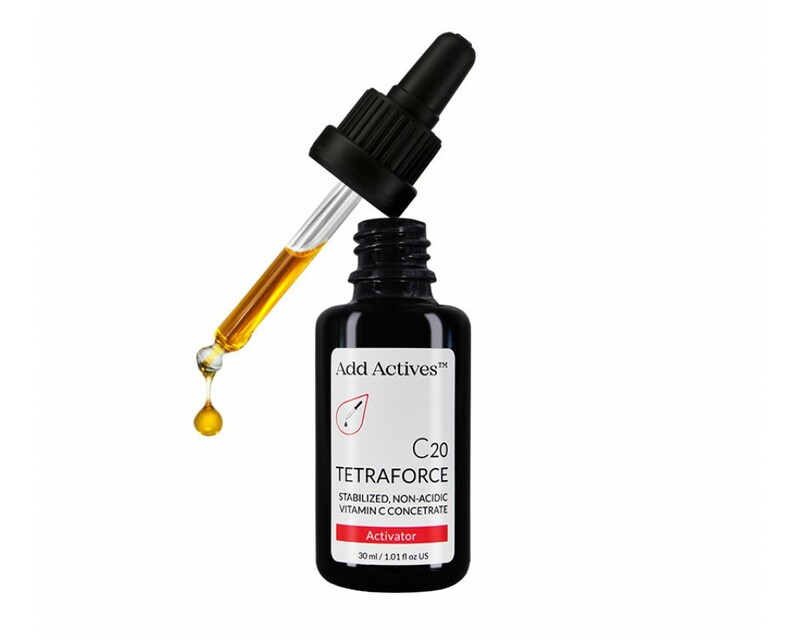 C20 Tetraforce Activator is designed to even & brighten skin tone, support natural collagen production, minimize the appearance of existing wrinkles, scars & stretch marks, and control the damage caused by free radicals. Vitamin C derivative, Ascorbyl Tetraisopalmitate, is widely recognized as the highest quality Vitamin C ester available, with many clinically proven benefits for skin. Our C20 Tetraforce Activator delivers a generous amount of this highly praised active. Ascorbyl Tetraisopalmitate, supercharged with other potent antioxidants, helps skin to protect itself from environmental aggressors, such as: pollution, damaging UV rays, harmful reactive oxygen species (ROS), and it also inhibits skin's surface lipid peroxidation. This is not your usual Vitamin C product. With C20 Tetraforce Activator you will notice the difference upon first application. Light, dry oil glides on smoothly, sinks into the skin quickly and leaves your skin feeling supple and nourished. No sticky or greasy residue! Main carrier of active ingredients is antioxidant, bio-identical, vegetable derived Squalane, found in our own skin's sebum. Due to its skin identical structure, it offers many benefits for dry & rough skin, and minimizes the appearance of wrinkles. With regular use you can expect huge difference in appearance of your skin. Youthful, brighter, smoother, more even, vibrant, and radiant skin tone are just some of them. Our customers regularly report about their wrinkles, fine lines, skin discolorations, blemishes, and age spots being less noticeable, they generally look younger, fresher, and rested. Lifting effect has also been reported. We want you to enjoy the same great results! Our unique, science driven, innovative formula works well with all skin types. It is suitable for Men (even as an after shave) and Women. It is especially beneficial for prematurely aged, mature, dry, and dehydrated skin types, and for everyone sensitive to acidic Vitamin C serums. We use natural and organic ingredients whenever possible. 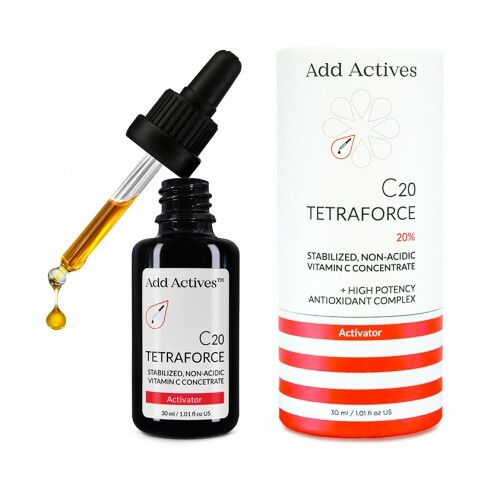 HOW TO USE C20 TETRAFORCE ACTIVATOR? Extremly potent antioxidant concentrate can be used as an Activator (Booster) to upgrade & strengthen your current skin care routine or can be used as is as an intensive Anti-Ageing treatment. 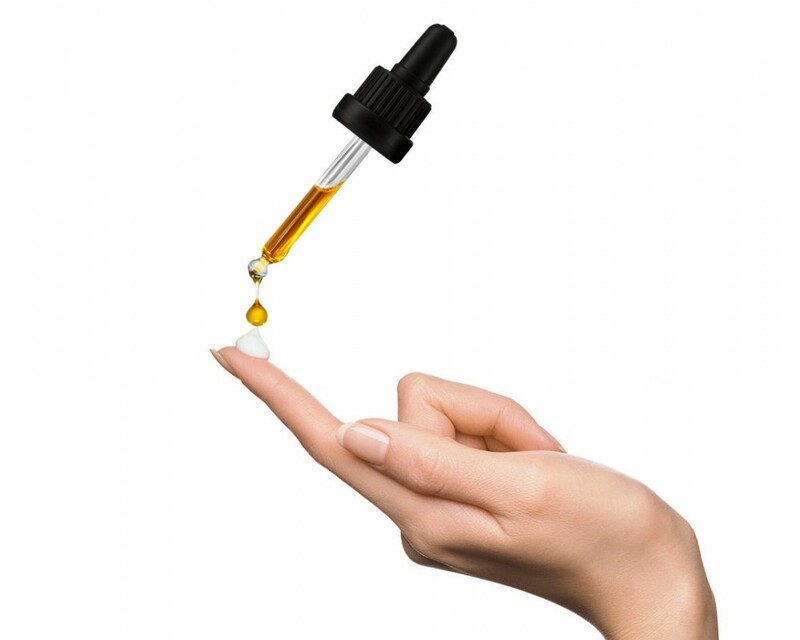 In the palm of your hand mix 1-2 drops into your regular dose of moisturizer, serum or oil. If your skin is dry&mature, not prone to pore clogging, you can mix it with products with equal or heavier consistency. If your skin is combination, oily, and prone to pore clogging, always dilute with serums/moisturizers/oils with lighter consistency than C20 Tetraforce Activator. Some great light oils for oily skin types are: jojoba, grape seed, borage, and primrose oil. For a more intensive treatment apply 2-3 drops twice daily to a cleansed face, neck and décolletage. 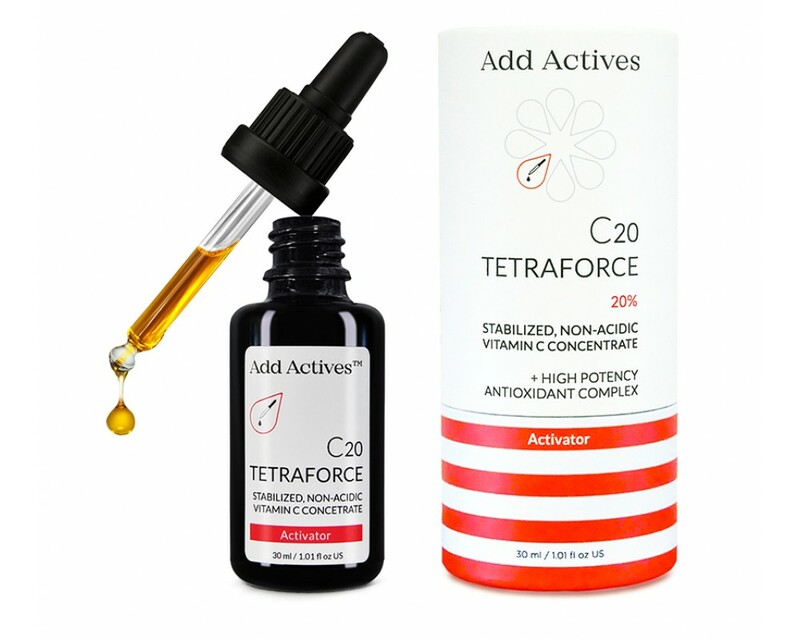 C20 Tetraforce Activator can be used daily - mornings & nights. If used in the morning, layer it with sunscreen. Do not mix or layer C20 Tetraforce Activator with products which contain: Niacinamide, AHA's, BHA, Copper or Copper peptides. Avoid the eye and lip areas. Contains Alpha Lipoic Acid. May cause mild tingling when applied. Squalane, Ascorbyl Tetraisopalmitate (Vitamin C), Rosa Canina (Rosehip) Seed Extract*, Punica Granatum (Pomegranate) Seed Extract*, Rosa Canina (Rosehip) Fruit Extract*, Thioctic Acid (Alpha Lipoic Acid), Ubiquinone (CoQ10), Tocopherol, Tocotrienol, Ascorbyl Palmitate (Vitamin C). Antioxidant, bioidentical, vegetable derived, light & dry oil, naturally found in our own skin's sebum. Due to its skin identical structure, it offers many benefits for sensitive, mature, dry & rough skin, and minimizes the appearance of wrinkles. Squalane restores barrier function, by keeping skin hydrated, nourished and supple. Great carrier for other antioxidants, makes formula more stable (antioxidants in squalane better resist oxidation compared to antioxidants in water solution). Stable, oil soluble, non-acidic, non-peeling vitamin C derivative, with antioxidant, and skin brightening activity. Great alternative to acidic Vitamin C (ascorbic acid). Better tolerated by sensitive skin than acidic formulations. Supports natural collagen production, minimizes the appearance of existing wrinkles, age & sun spots, great for taking care of scars & stretch marks. Vitamin C is a potent antioxidant, and successively controls damage caused by free radicals. Antioxidant, great source of carotenoids and natural source of trans retinoic acid. High in linoleic and alpha linolenic fatty acids, very soothing, and best choice for minimizing the appearance of scars and wrinkles. Helps to prevent premature aging, hyperpigmentation, and dehydration. Best used on wrinkled, sundamaged skin. Supercritical CO2 extraction ensures better quality, purity and stability of the rosehip seed & fruit extracts. The only natural source of Omega 5 fatty acid - punicic acid. Great source of conjugated linoleic acid. Antioxidant, polyphenol (ellagic acid), and phytoestrogen rich oil, effectively protects skin from many environmental stressors. Also great choice for sundamaged, prematurely aged, dehydrated and sensitive skin types. Restores skin barrier. Supercritical CO2 extraction ensures better quality, purity and stability of the pomegranate oil. Universal antioxidant, both water and oil soluble, naturally present in the body. As with CoQ10, levels of Alpha Lipoic Acid decline with age. It is considered to be even stronger antioxidant, and better at 'catching' free radicals than Vitamin C & E. It reduces the appearance of aging skin, wrinkles, and fine lines. Antioxidant, cell energizer, naturally present in the body. Levels of CoQ10 decline with age, and it must be restored. Topical application of CoQ10 protects skin from free radical damage, brightens skin tone, helps sundamaged skin to regenerate, improves appearance of prematurely aged, mature, and wrinkled skin. CoQ10, Vitamin E & Alpha Lipoic Acid restore and enhance the antioxidant effect of Vitamin C, and should be incorporated in every Vitamin C formulation. Vitamin E is an antioxidant naturally present within the skin. It protects skin's lipids (prevents lipid peroxidation), and reduces the appearance of fine lines and wrinkles. It is best for both, morning use - to protect skin from UV exposure, and for evening use - to reverse UV damage. Great for all skin types, especially for prematurely aged, sundamaged, mature, dry, rough, and dehydrated skin types. While Tocopheryl Acetate (synthetic form) is mostly used by other skin care companies, we at Add Actives use strictly natural, extremely potent, mixed Tocopherols & Tocotrienols. Vitamin E, CoQ10, and Alpha Lipoic Acid are considered best trio for complementing Vitamin C.
Another oil soluble Vitamin C derivative with similar characteristics to Ascorbyl Tetraisopalmitate, but less potent. It is also a great antioxidant and therefore good formula stabilizer. WHAT IS THE pH OF C20 TETRAFORCE ACTIVATOR? C20 Tetraforce Activator is water free (anhydrous) formula, so there is no pH value. pH value can be measured only in aqueous solution - water. C20 Tetraforce Activator is gentle, non-acidic formula, meaning - our Vitamin C does not need to burn its way into the skin. WHY IS IT ORANGE? DOES IT MEAN IT HAS OXIDIZED? The orange colour comes from carotenoids present in our Rosehip & Pomegranate extracts. CoEnzyme Q10 and Alpha Lipoic Acid give the product dark yellow colour. Orange colour of the finished product simply indicates a high amount of coloured antioxidants. Vitamin C in our formula is stable, and does not oxidize within given shelf life, if stored at the apropriate conditions. We do not use any kind of fragrances - synthetic or natural, not even a drop of essential oils. 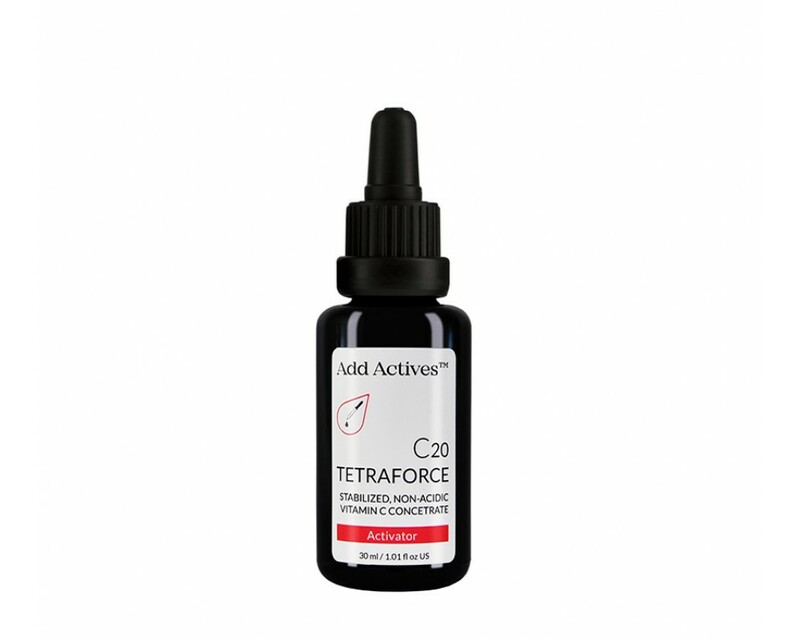 C20 Tetraforce Activator smells typically of Rosehip and Pomegranate extracts. While every effort is made to satisfy the widest possible range of skin types, we can not 100% guarantee the product will not clog your pores. A huge role in pore clogging plays the combination of products used along with C20 Tetraforce Activator. Make sure you don't combine it with products with high content of coconut oil, shea butter, cocoa butter or with heavy, thick creams. Squalane, the main carrier ingredient of C20 Tetraforce Activator, is naturally present in the sebum of our skin. If your skin is dry & mature, it probably lacks oil, so you should be perfectly fine with undiluted use. If your skin is combination/oily, prone to pore clogging, and you want to be on a safe side, diluting the C20 Tetraforce Activator is recommended. Always dilute with serum, moisturizer, or oil with lighter texture than C20 Tetraforce Activator. However, we have lots of customers with young, oily skin types, and tehy never break out with regular use of undiluted C20 Tetraforce Activator. Based on the feedbacks, we can conclude the product is generally not comedogenic. HOW LONG DOES A 30 ml BOTTLE LAST WITH REGULAR USE? One bottle (30 ml) can last up to 5 months with regular, undiluted (2-3 drops), twice daily, use. WHAT IS THE SHELF LIFE OF C20 TETRAFORCE ACTIVATOR? The shelf life of an unopened product is at least 2 years from the date of production. Keep it in a dark, cold place, away from sunlight.